Windows 7 has gone into manufacturing on July 22, 2009 and with general retail availability set for October 22, 2009. Well atleast on time as comapred to Windows Vista. It is tauted as “Refined” Windows Vista. So you sold Unrefined stuff as premium and Ultimate and Genuine, you nasty, mishchiveous Uncle Bill. (Gates not Clinton). While Bush was raking in refineries you were so unrefined how aweful. Lucky for you that your name is Bill Gates. Atleast you can make a living by selling books on how to become millionaire if u become Bankrupt so you are secured far better than American Social Security plan can offer. Atleast you accepted in interview taht Vista was the worst Window and you atleast remedied it. But as always it is the pattern of one good Window after another good Window with a bad Window in between. Anyway Windows 7 looks good, Ok it looks like it is not made by color blinds and has all the primary colors red, green, blue, yellow in right place, as compared to Black and White Vista. Features are just so good and really needed while doing away with unecessary ones. All the godies of XP are restored. And there is XP Mode to run all older applications. (this is equal to a virtual pc running XP SP 3 in your windows 7). So now you can safely and easily use 64 bit Windows 7. Especially good for people who really need to use closed source old legacy critical Applications. I know one person who still has one pc with Windows 98 due to a Application required for his business. Home Premium, Professional and Ultimate will be available for retail sale in most countries. Get Professional or Ultimate as XPM is not available in Home editions. And get 64 bit only as many applications are becoming 64 Bit. I use 64 bit Vista and apart from minor problems(All solved) I like it very much. Also Windows 7 runs faster then Vista on same hardware as it is lot more optimized. A number of capabilities and certain programs that were a part of Windows Vista are no longer present or have changed, resulting in the removal of certain functionality. 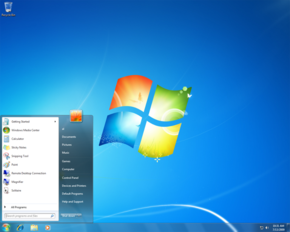 Some notable Windows Vista features and components have been replaced or removed in Windows 7, including the classic Start Menu user interface, Windows Ultimate Extras, InkBall, and Windows Calendar. Three applications bundled with Windows Vista — Windows Photo Gallery, Windows Movie Maker, and Windows Mail — are not included with Windows 7, but are instead available for free in a separate package called Windows Live Essentials. Additionally, it is no longer possible to eliminate anti-aliased text from the user interface. Unlike in Windows Vista, window borders and the taskbar do not turn opaque when a window is maximized with Windows Aero applied. Instead, they remain transparent. The taskbar has seen the biggest visual changes, where the Quick Launch toolbar has been replaced with pinning applications to the taskbar. Buttons for pinned applications are integrated with the task buttons. LIKE MAC OSX. All in all a very Good OS after Windows XP. As for Linux the best one currently is Ubuntu 9.0.4(I am using), and Fedora 11. Of which I like Ubuntu much better and I prefer Gnome over KDE or any other. Ubuntu is the Easiest and Best Linux made for Humans till now. Try it, and you will see the sense in it.